The present study deals with isolation of active constituent, rohitukine from the stem bark of Dysoxylum binectariferum, and synthesis of a series of its new sulphonyl derivatives aiming to enhance its therapeutic efficacy. Rohitukine has been isolated with more than 95% purity and ten new semisynthetic analogs have been prepared using different sulphonyl chlorides. 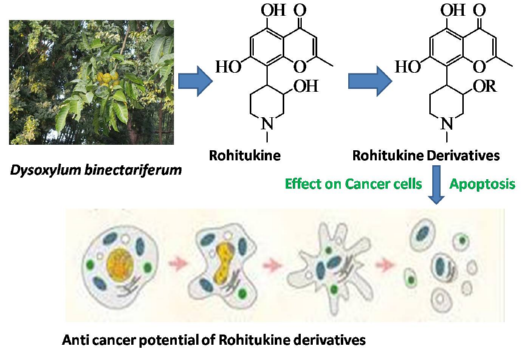 These derivatives were evaluated for anticancer activity against MCF-7 (ER +ve) and MDA-MB-231 (ER -ve) breast cancer cell lines. Compounds K6, K8 and K10 showed significant activity against breast cancer cell lines at a concentration of 17.5 µM, 17 µM and 19 µM in MCF-7 and 20 µM, 9.8 µM and 28.5 µM in MDA-MB-231 respectively. These compounds induced significant apoptosis in MCF-cell line. Further work may enhance the anticancer activity.